One of my favorite weddings to work on was Caroline and Brock’s winter wedding at Emerald Lake Lodge (one of our favorite places!). Caroline and Brock are one of the nicest couples and working with them was a pleasure! From the start, I knew working on their wedding would be a wonderful journey. I loved that Brock was very involved in the wedding process and Caroline put so much of her heart (and creative soul) into their wedding. Working together was a collaborative effort as Caroline really wanted to “DIY” several projects. I also loved that they wanted to incorporate their personalities into every aspect of the wedding and it was really important to them that their guests were well taken care of! Caroline and Brock live in Red Deer, Alberta but spend much of their free time in the Rocky Mountains. Brock proposed to Caroline while snowshoeing during a surprise weekend at Emerald Lake Lodge, so it was a natural fit to get married there too! Caroline had actually never really thought about getting married in the winter but after Brock suggested it, she really warmed to the idea. They both love skiing and the outdoors; Emerald Lake Lodge was a natural fit! Once the wedding venue was chosen, we got to work. One of the first things Caroline and Brock did was choose Julie Williams Photography for their wedding! The couple loved Julie’s fun, relaxed and up-beat personality, and of course loved her photography style! 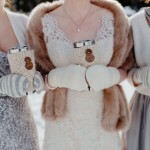 Julie did a fabulous job photographing all the details on snowy and somewhat chilly February day! Caroline looked gorgeous with her hair and make-up done by Stephanie Roy. The scene was set for a magical, outdoor winter ceremony with a mountain view, on the Cilantro on the Lake patio. Snowflakes and scarves ceremony decor. I love that the Caroline and Brock wanted to take care of their guests (as they were having an outdoor ceremony). They provided hand-warmers (packaged in cute bags – an easy DIY project), as well as fleece scarves, gloves and blankets. Guests helped themselves to whatever they needed before the ceremony. Warm up station by Naturally Chic | Photo by Julie Williams Photography. Here comes the bride (with her mom and dad). Caroline looked amazing in her vintage inspired, lace gown. Caroline and Brock are so sweet and their ceremony was touching. Caroline and Brock decided to include a wine box filled with love letters during their ceremony. The plan is to open it on their fifth wedding anniversary! Yay! Congratulations! We wish Caroline and Brock a lifetime of happiness! Following the ceremony a hot chocolate / coffee station was set up for the guests to enjoy while the family and wedding party had their portrait session with Julie. Even though it was a little chilly out, the guests didn’t seem to notice as they milled about. Time for some fun… Enjoy Julie’s photos of the couple and their wedding party and some winter fun! Caroline and her girls looked absolutely adorable! Brock actually proposed to Caroline on a snowshoe trip out to Emerald Lake Lodge, so it was only naturally they get a photo of the two of them snowshoeing. Brock and Caroline LOVE skiing, so it is no surprise their wedding has a ski theme to it (You’ll see more creative ski ideas in Part 2 of this post)! We hope you will stop by again soon to see Part 2 of Caroline and Brock’s winter wedding at Emerald Lake Lodge. Their wedding colors were inspired by this HBC blanket and of course their love of skiing! Don’t miss it! Planning a winter wedding at Emerald Lake Lodge, give us a call at 1.888.274.6994 or email us at hello@naturallychic.ca! On our last post, we shared Part One of Rachel and Mike’s Fall Wedding at the beautiful Canadian Rocky Mountain Resort’s, Deer Lodge in Lake Louise, Canada. Assisting Rachel and Mike with their wedding plans was a true privilege. I love working with couples who are fun-loving and easy-going. Rachel and Mike are the epitomy of fun-loving and it’s so evident in all their photos! One of the things I also loved about working with Rachel and Mike is that they really wanted to make their wedding day a true reflection of themselves, and it was really important to them that their guests had fun! I’m sure they did! Christina Craft of Funky Town Photography provided the gorgeous imagery along with second shooter, the talented Erika Jensen of Canmore. Deer Lodge is an amazing venue for a wedding set against the world’s most photographed lakes, Lake Louise. After the wedding ceremony, Rachel and Mike planned a fun cocktail hour for their guests, that included “Mike’s” Scotch bar where guests could sample some of Mike’s favorite Scotch. To add to the fun, we created a fun sign for Mike, as well as we engraved wood cards that described the various Scotch. Another fun idea that Rachel and Mike planned for their guests was these fun, whimsical pins that guests could pin on themselves during cocktail hour. Guests had fun choosing their pins and wearing them throughout the evening. Rachel and Mike’s “Grand Entrance” into their reception room. In keeping with the ambience of the venue, Rachel and Mike wanted to keep their decor natural and rustic. We used Deer Lodge’s table and chairs, with simple burlap runners, wood slices and mason jars flower arrangements adorning the tables. Flower arrangements were provided by the talented Sarah Mayerson Design. In keeping with Mike’s Scottish heritage, Scottish Thistles were tucked amongst the orange dahlias and greenery. We introduced a little of Mike’s family tartan with ribbons tied to mason jars and we added engraved wood tags (with the Wong Squared wedding motif) to “brand” their wedding and give it a cohesive look. We incorporated lots of warm woods into their wedding decor. Warm wood table numbers by Naturally Chic | Photo by Funky Town Photography. The couple had little books at each table soliciting their guests for marriage advice: such as “How should we celebrate our first anniversary”, to dating suggestions and marriage advice. Guest came from all over, but I think the guests that traveled the farthest were from, not surprisingly, Scotland. Rachel and Mike had a unique wedding kissing game! If guests were going to get them to kiss they had to correctly pronounce Scottish sayings and verses. This provided a fair amount of hilarity as guests attempted the sayings! Of course, the scottish relatives had no problem getting the bride and groom to kiss! Mike had a scotch bar, so Rachel shared one of her favorite treats for guests. A Popcorn bar! We used rustic wine barrels and wood apple baskets to keep it rustic! We made a custom sign for Rachel too! A friend of Rachel’s family, who has a bakery, made several beautiful wedding cakes for the guests to enjoy! Throughout the evening, there was plenty of entertainment including dancing and games, and the hit of the evening was a fun photo booth by Silly Booth. Good night from Deer Lodge in Lake Louise! If you’ve missed it check out Part One of this fun, Lake Louise fall wedding here. We had a wonderful time helping our couple plan and design their rustic, Emerald Lake Lodge summer wedding. The couple had the talented international wedding photographer, Jesse Hisco take their stunning photos. Jesse does mountain weddings in the summer in Canada and then photographs in Australia and around the globe the rest of the year. The couple decided not to let a little drizzle dampen their spirits on their most special day and they decided to have the ceremony on the patio outside of Cilantro on the Lake at Emerald Lake Lodge. With the stunning mountain views and beautiful emerald green waters, Emerald Lake Lodge is such a special place for a wedding! As our beautiful bride was getting ready Jesse took photos of the essential wedding details. Here’s the bride’s classic, elegant dress. The beautiful boutonnieres and wrist corsages were created by the amazing Sarah Mayerson Design. I loved her use of blackberries in the corsages. The groomsmen relaxed outside their cabin as the couple readied for their ceremony. The groom is ready to go. And the bride is also ready with her beautiful updo complete. Hair and make-up was by local talent Stephanie Roy. I love the natural, organic bridal bouquet created by Sarah Mayerson Design. The scene was set with beautiful ceremony arrangments on rustic wood pillars and the lovely harpist Jacqueline Dolan performed for the waiting guests on the Cilantro on the Lake at Emerald Lake Lodge. Harpist Jacqueline Dolan also has an amazing voice and she sang beautifully during the signing of the registry. It was a beautiful touch to a beautiful ceremony. The wedding reception took place at Cilantro on the Lake at Emerald Lake Lodge (one of our favorite venues for weddings!). We love working with all the many talented wedding professionals on this wedding as it makes our job so much easier! Sarah Mayerson Design’s never fail to “wow” and these gorgeous, reception natural florals were no exception. We loved designing a natural, rustic wedding for the couple at Emerald Lake Lodge as our decor complements the rustic beauty of the venue. As usual we made most of the wooden details for the decor, including the wood table numbers, log place card holders and the wooden “Mr and Mrs.”signs. For the couple’s cake table we used the iconic buffet hutch in Cilantro on the Lake. The lovely cake was designed by the oh so talented Barbara Laberge from Cake Creations. Their favours were jars of jam and preserves made exclusively by the Canadian Rocky Mountain Resorts in various flavors. We covered them with burlap fabric, twine and a tag we engraved from wood veneer. We used rustic detailing including our wood slices to complete the entire look. This cute cake topper was hand-made by our friend and wedding day assistant Melanie Frank! For the couple’s seating chart, we made it out of walnut wood veneer that we engraved with the guests’ seating arrangments. We also made a custom wood card box from reclaimed oak for the couple. Finally, here are a few snap shots we took of some of the details. We also made all the stationery for the couple including their invites, menu’s and place cards. Here we used some real wood detail for the menus. Thanks for stopping by and viewing one of our favorite Emerald Lake Lodge summer weddings with us! For more information about planning your Emerald Lake Lodge summer wedding, visit our website the Naturally Chic website. Note -To maintain privacy the couple did not want their name or photos published. This real mountain wedding is from the amazingly talented Christina Craft from Funky Town Photography. If you get a chance, check out the portfolio on Christina’s site; it is filled with beautiful works of art! In the meantime, here is a photo collage of some decor we made for one of our favorite couples, Rachel and Mike who were married at Deer Lodge, Lake Louise. We had a wonderful experience working with Rachel and Mike, who were so laid-back and fun! Working with the staff of the Canadian Rocky Mountain Resort’s Deer Lodge was also an amazing experience. We enjoy all our weddings at CRMR properties and especially love Lake Louise weddings! You can also see more of Rachel and Mike’s rustic mountain wedding here. We hope to blog much more often, so please stop by again as we will be sharing some of our favorite past weddings. For more information about our wedding design and planning services, contact us at www.naturallychic.ca. Email hello@naturallychic.ca. Also visit our sister site Canadian Mountain Chic for more wedding inspiration! Yesterday we shared the Lakeside Wedding shoot we created for the new Calgary Bridal Guide, and today we’re sharing more of the details! All the photos were taken by One-Edition: Weddings by Rafal Andronowski Photography, and the gorgeous flowers are from Sarah Mayerson Design. Both Rafal and Sarah are super creative and talented at their craft! I’m so enormously grateful to work with talented wedding professionals on collaborative works like this. For our lakeside wedding table decor, I wanted to keep the look fresh and uncomplicated; suitable for the outdoors. I chose to use a light linen runner and a simple place settings. I used real weathered wood for a place mat and chose a crisp linen napkin on white china. The same weathered wood veneer used for the placemat was used to create a simple, natural themed menu. For the “place cards” I made tiny wood paddles from maple wood leftover from other projects! To complete the theme I added lots of natural elements such as rocks and driftwood. In keeping with the weathered wood theme, we made a wood table number and bride and groom chair signs from reclaimed barn wood. A simple, rustic cake placed on a weathered wood riser, with a canvas “cake topper” flag to match the canvas bunting. And of course, what outdoor, lakeside wedding is complete without s’mores by the campfire? A few more details to enhance the ambience! We hoped you’ve enjoyed our Lakeside wedding shoot and perhaps found some inspiration for an outdoor wedding in the Canadian Rocky Mountains! Thanks for stopping by. For more inspiration, check out the Calgary Bridal Guide which is on newstands now in the Calgary and surrounding areas! A huge thank you to the Calgary Bridal Guide for featuring this shoot, to Sarah Mayerson for the stunning florals, and to Meg and Raf from One-Edition: Weddings by Rafal Andronowski Photography for sharing these great photos with us! And of course, to Don from Naturally Chic who built the tables, wood risers and some of the decor, and helped with the set up at Two Jack Lake! Credits: Publication: Calgary Bridal Guide Designer + Stylist: Sharon from Naturally Chic Photographer: One-Edition: Weddings by Rafal Andronowski Photography Flowers: Sarah Mayerson Design Stationery: Naturally Chic Designs Wood Elements (tables, wood letters, wood risers, wood paddles, table numbers, bride and groom signs etc. ): Naturally Chic Cake + Favors: Naturally Chic For more information about our planning and design services visit us at www.naturallychic.ca or contact us at hello@naturallychic.ca or visit our sister site Canadian Mountain Chic for more inspiration! One wedding trend that I’m seeing right now and I absolutely loving, is that of “bountiful blooms”; flowers that are organically arranged in what almost appears to be a haphazard manner as if plucked from the garden. Flowers, berries, branches and twigs look natural and not overly posed or symetrical. These arrangements look perfectly in place in both elegant and casual settings alike. They can be luxurious and bountiful, or hand-tied and placed in a mason jar. No matter what your wedding style, there’s almost certainly a way that you can incorporate this beautiful trend into your special day – from centerpieces, to bouquets, to swags or chair ties! Even celebrities are paying attention to this floral wedding trend. Here’s Blake Lively’s lovely bouquet she carried when she married actor Ryan Reynolds. This arrangement would be perfect for a winter wedding! Here is a gorgeous floral chair tie found via Pinterest – from Once Wed and by wedding stylist and designer Joy Thigpen. Here’s a few more gorgeous floral trends for your wedding inspiration and sure to be found in many 2013 weddings! The natural, organic look is perfect for elegant or casual, laid-back mountain weddings here in the Canadian Rocky Mountains. I love the use of interesting containers and vessels such as the vintage urn shown below. Happy 2013 and happy planning for all the newly engaged couples! For more information on our wedding design and planning services contact us at hello@naturallychic.ca, or 1.888.679.9056 or visit us at naturallychic.ca.